RECOVERING A MARK BUOY which is put down by a cable repair ship as soon as she reaches the position of a fault in the cable. The mark buoy may weigh anything from 7 cwt to 37 cwt, and is moored with mushroom anchors weighing from 3 cwt to 7 cwt. THE laying of submarine telegraph cables across the wide oceans, whereby continent is linked with continent and far-off islands are gathered into the vast network of modern commerce and news-distribution, is a work that- is fascinating not only to those who have to carry it out, but also to anyone who has some idea of the countless activities which are called cable-laying. These activities take place in factory and laboratory, and in ships on the high seas. The final outcome of the work is seen in the flashing of words from one side of the world to the other as fast as thought. Before any cable is laid to-day in unknown waters there is much work to do, because those who are responsible for putting the cable down and those who manufacture it must all have a clear idea of the conditions of the bed in which the cable is to lie. For this purpose preliminary surveys are made, the depths of the ocean are plumbed, and knowledge of a most picturesque kind often comes to light. Subsequent surveys with more advanced methods of taking soundings have revealed that the area of the Atlantic Ocean which actually received the name of Telegraph Plateau was, though flat enough, not quite so regular as had been thought. Within comp-aratively recent times, when the contractors were laying the Western Union cable, it was ascertained that a group of hitherto unrecorded mountains existed beneath the Atlantic, the highest of them being 6,000 feet above the surrounding bottom. These mountains are now officially known as the Faraday Hills, being named after the cable ship Faraday which found them. Various other surveys have discovered great mountain ranges and pits of almost incredible depth in various places. It is important that such depths as these should be discovered before any attempt is made to lay cable, for sudden changes place terrific strain upon a cable. Cable is not laid in the greatest depths because of the strain it would have to bear when being raised for repairs. The greatest depth at which cable has been laid so far is about 3,500 fathoms (21,000 feet). During the preliminary survey the ship steams a zigzag course along the line of the proposed route, each arm of the zigzag being about five miles in length if the depth does not vary considerably, soundings being taken at the end and centre of each arm. One of the great advantages of the sonic, or echo, system of taking soundings (see page 1212) is that the ship does not have to be stopped while the sounding is taken, as is essential when line-and-sinker sounding-machines are used. The great British cable ship Dominia has taken as many as 917 soundings in the North Atlantic in twelve days, part of the time in a gale. Sometimes the sonic system cannot be used, for when it is necessary to know the exact nature of the sea-bed line-and-sinker machines must be used; by this means samples of the bottom of the sea can be brought to the surface, thus giving information as to whether a cable will lie on sand, ooze, coral or rock. SECURING THE CABLE which the specially-designed grapnel has raised from the sea-bed. The grapnel is hove up by the drum of the picking-up gear and men are lowered over the bows in boatswain’s chairs to secure the cable with chains and ropes. This done, the electricians take charge and remedy the fault. It is also important to know the temperature and pressure of the sea at any point where a proposed cable is to lie, for these factors have considerable bearing on the insulation resistance of the gutta-percha, with which the core of the cable is surrounded, and affect calculations which electricians have to make when a fault or break occurs far out from the ends of a cable. When all the preliminary work has been done and the hundreds of miles of cable have been manufactured, the cable ship takes the cable on board into her storage tanks. This is not so simple a process as it may sound. In the ship are circular tanks, and into these the cable is carefully placed. The coiling is done by men sitting on stools, and the cable is brought past them by a man running round and round with it. This care is essential, for should a kink occur during subsequent paying-out not only might the cable be broken, but even men’s lives might be endangered. For safety purposes life-lines hang down in the tanks so that men can make a swift exit should the cable “take charge” during paying-out operations. As the cable is being coiled the tank is flooded with water up to within a few inches of the last “flake”. Cable is always kept under water, since gutta-percha is liable to crack when dry. While the cable is being loaded into the tanks note is taken of all splices, each section of the whole cable being recorded. As the resistance of each section may vary slightly, such a record helps in the location of a fault. Cable is of three kinds - deep-sea, intermediate and shore-end. Intermediate and shore-end cables are far more heavily protected with steel wire than deep-sea lengths, the amount of sheathing depending on the local conditions. The action of the sea, rocks, coral, the possibility of ice and similar factors make it essential that intermediate or shore-end cable be capable of resisting comparatively rough treatment. On the other hand, deep-sea cable lies snug and quiet in the unutterable stillness of the ocean depths, resting on its bed of ooze or sand and never moving from one year’s end to another unless something unusual happens. So quietly does it normally rest that cable brought up after many years of submersion has been found to bear on its upper half the whitewash with which it was painted in the factory. The laying of shore-end cable may prove tricky work, for rarely can the ship herself get close enough inshore. Shore-end cable is usually coiled on to lighters which are towed inshore. One end is then hauled on to the beach and is laid in a trench leading to the cable house. The lighter is then towed seaward, paying out as she goes. The seaward end is sent on board the cable ship for splicing on to the main deep-sea or to the intermediate length. Hauling the end up the beach may be done in one of many ways. In tropical parts of the world there are usually crowds of natives only too anxious to lend a hand. At Sennen Cove, Land’s End, where many cable ends come in, horses are regularly used. In other places tractors have been used, and even railway locomotives. Points as far as practicable from anchorages are chosen for sending in shore-ends, for the risk of cables being fouled by anchors is great. Cables suffer possibly more from this trouble than any other. Sir Charles Bright, the famous cable engineer, has spoken of as many as thirteen anchors being picked up on a fourteen-miles length of cable in the Firth of Forth. Cable ships have sheaves at the bows and stern, duplicate paying-out and picking-up gear being fitted correspondingly. It may seem strange that cable should be paid out at the bows of a ship, but it has been found by experience that when laying cable in shallow waters and strong tides a ship answers her helm better and is generally more manageable when cable is being paid out over the bows. When laying long lengths of deep-sea cable, however, the stern sheaves and paying-out gear are invariably used. The cable comes out of the tank, passes over sheaves on the deck, round the drum of the paying-out gear, under the sheave of a dynamometer, and thence over the sheaves into the sea. The dynamometer is an important piece of machinery, for it shows the strain to which the cable is being subjected. The man standing at the brakes of the paying-out gear can see the dynamometer, and can thus ease the brakes if a sudden strain, due perhaps to the rising of the ship’s stern, falls on the cable. One of the most interesting points about laying cable is that a certain percentage of slack has to be allowed. Cable is not laid down straight and taut. A percentage of slack is necessary to conform to the contour of the sea-bed, for the most painstaking survey cannot reveal every little dip and hollow. It is important, however, that cable should not festoon, or bridge, projecting peaks. The calculating and estimating of the amount of slack required is work that only experience, judgment and careful calculation can accomplish. The percentage of slack paid out is estimated in this way. The amount of cable which has left the ship and gone into the sea is readily ascertained from the indicator on the paying-out gear, and the distance the ship has travelled is known. But because of factors such as currents, the amount of slack in the cable cannot be ascertained by comparing the two. Therefore, in addition to laying cable, the ship lays a pianoforte wire. This is laid without slack and quite taut, lying straight on the sea-bed. Thus, by comparing the length of wire paid out with the length of cable paid out the amount of slack in the latter is ascertained. During the whole period of laying, electric communication is maintained between the shore and the ship, messages being sent at regular intervals through the cable as it is being laid. This is a precaution against the putting down of many hundreds of miles after a fault has occurred, and should the electricians discover the slightest trouble, steps are immediately taken to deal with it. By resistance tests the electricians can learn if a fault has developed in the unexpended portion of the cable lying in the tanks, and the fault can be remedied before the cable is paid out. In the unlikely event of a fault occurring in cable already laid but not far astern, the ship would pick up what, she has laid. Should the fault be found to be a long way astern, it would be necessary to cut the cable, buoy and sink the end, and return to the position of the fault, there to grapple, pick up, and effect a repair. To-day such troubles are rare. The ship steams ahead on her course, the cable passes out over the sheaves, and there are none of the terrific excitements which were part and parcel of cable-laying in the Agamemnon and the Great Eastern in the days of the first Atlantic cable. When comparatively short distances are to be covered it is the usual practice to lay both shore-ends first. Thus when a ship is coming near to the end of the deep-sea cable her lookout men keep their eyes skinned for the buoy marking the position of the farther shore-end. On arrival the buoy is cast off and the shore-end is brought inboard. Tests having proved the shore-end to be in working order, the splice is made and the cable is now all one from shore to shore. The modern submarine cable rarely breaks down. Such troubles as it may be subject to are almost invariably due to outside causes. Shore-ends may be chafed against rocks or coral, or even be injured by ice in northern waters. Occasionally sharks, sword-fish, saw-fish and whales interfere in some way with deeper cables. Whales have been known to get themselves entangled in the slack of a deep-sea cable and in their efforts to get free so imprison themselves that, unable to rise to the surface, they have been drowned. Other creatures do not attack the cable, as has sometimes been supposed. They injure it and cause breakdown of insulation by trying to rake off succulent marine growths or animals which have made it their home. A TWIN-SCREW CABLE SHIP of 1,984 tons gross, the Lady Denison-Pender was built in 1920. She has a spoon stern and at her bows are the sheaves over which the cable is paid out or taken in. The vessel belongs to the Eastern Telegraph Company Ltd. She has a length of 269 ft 3-in between perpendiculars, a beam of 38 ft 1-in and a moulded depth of 25 feet. The more frequent cause of injury to cables is fouling by anchors and trawls. 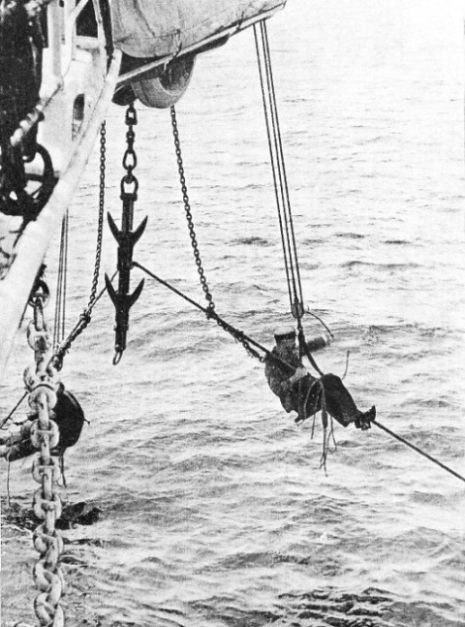 Wherever possible cables are laid well away from anchorages, but even then, on the crowded coast of Great Britain injuries from anchors are fairly frequent. Rarely does a winter pass without the General Post Office cable repair ships Monarch and Alert having to go to sea in a hurry to repair cables injured in the English Channel. Methods of trawling have improved, but the cable companies have to protect their property by paying trawler owners for loss of gear cut away rather than have shipmasters free themselves from entanglement by cutting away the cable. 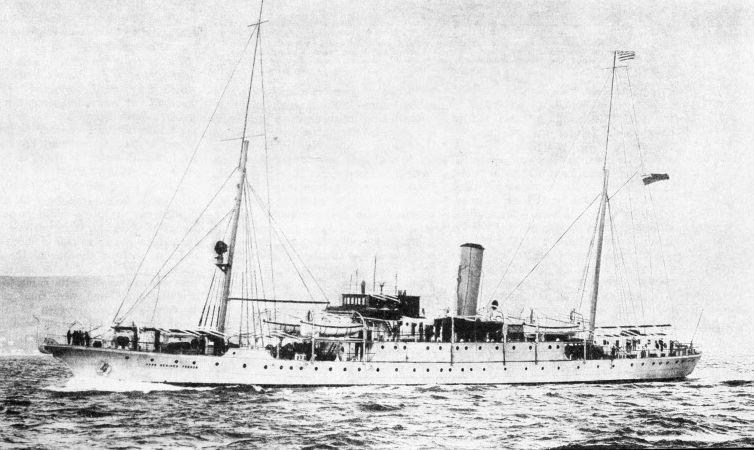 In the history of the submarine telegraph the greatest enemy to the cable has proved to be the smallest of animals, namely, the marine borers, various minute animals grouped together under the general name of teredo. These creatures are fond of gutta-percha and often creep within the sheathing of the cable and make their home in the material. By tunnelling into the insulation the teredo can ultimately cause a fault, and as this little creature often attacks in battalions the trouble caused may be enormous. In the past cable after cable has been silenced by such assaults. Now, however, means have been found for protecting the cable by wrapping the core with a tape composed of an alloy through which the marine borer cannot penetrate, so that faults from this cause are not nearly as frequent as they were. The breakdown of a cable is a serious business, for in addition to the expense to the owning companies or the Post Office of sending a ship to sea to effect a repair, there is the loss of revenue by interruption in traffic to be considered. Therefore the sooner a fault can be located and repaired the better for all concerned. To the landsman unacquainted with telegraphy it is frequently a source of wonder that the exact position of a fault can be estimated, even though the point of fault is hundreds of miles out in the ocean. The resistance of every section of a cable is known. By means of artificial resistances, which can be measured, an electrical balance is established between the artificial resistance and the resistance of the cable up to the fault. It being known in the cable house on shore that the resistance of the cable is, say, two ohms to the mile, when the artificial resistance establishes a balance at 2,730 ohms it follows that the fault will be found 1,365 miles from the cable house. Cable companies have detailed charts of the positions of their cables, and thus it is possible within a few minutes to establish the position in the ocean of the fault, and to that point the repair ship steams at speed. On arrival the repair ship’s first operation is to put down a mark buoy, which may weigh anything between 7 and 37 cwt, according to the depth of water. Mark buoys are moored with mushroom anchors from 3 to 7 cwt in weight, and several may have to be used where water is deep or where there is a strong current. THE SHORE END of a submarine cable is generally laid from a lighter which is towed out to sea as the cable is paid out. Near the shore the cable receives comparatively rough treatment; thus shore-end cable is more heavily protected with steel wire than deep-sea cable. 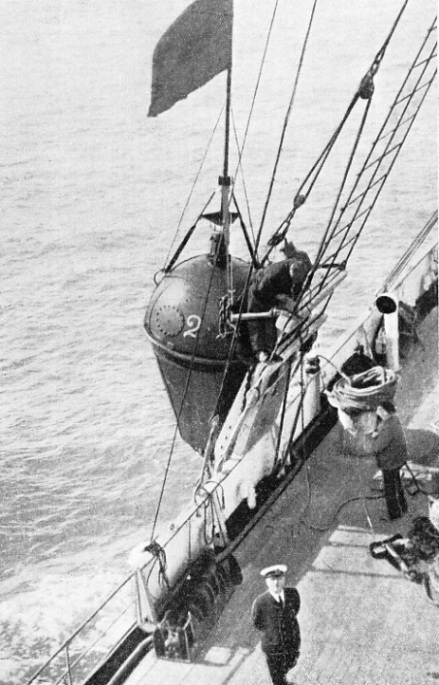 Having put down the mark buoy, the ship establishes its position by means of observations, using ordinary navigational methods for this purpose. She then steams to a distance of about three miles or so from the line of the cable according to the depth of water and proceeds to grapple for the cable, using a grapnel, chain and wire rope with a breaking strain of between 22 and 30 tons. Grapnels are of various kinds according to the nature of the bottom, for a type suitable for use where the cable may be buried in ooze is not suitable on a rocky bottom and would soon be broken. When a repair ship is seeking the end of a cable which has been completely severed she may grapple it so near the break that the end slips through the grapnel. On the other hand, if she hooks it at too great a distance the cable may break through its own weight. To deal with this situation the late Mr. F. R. Lucas introduced a highly ingenious type of grapnel which will hold the cable and cut it. Whatever type of grapnel is used, the rope to which it is attached is paid out over the bow sheaves of the ship and the strain is registered on the dynamometer. By watching this instrument it is possible to tell, by the sudden increase in strain, when the cable has been hooked. The dynamometer is also useful for telling when the grapnel has reached the bottom. In the days before the invention of the cutting-and-holding grapnel it was necessary to raise the whole weight of the cable from the bottom, and in deep water the cable might be lifted for a distance of many miles. Raising cable in this way was exceedingly difficult and tricky work, for the great weight caused continual breakages. Nowadays little trouble is experienced, and only such an unusual occurrence as lifting the carcass of a dead whale which has become entangled in the cable causes any variation in the usual routine of work. 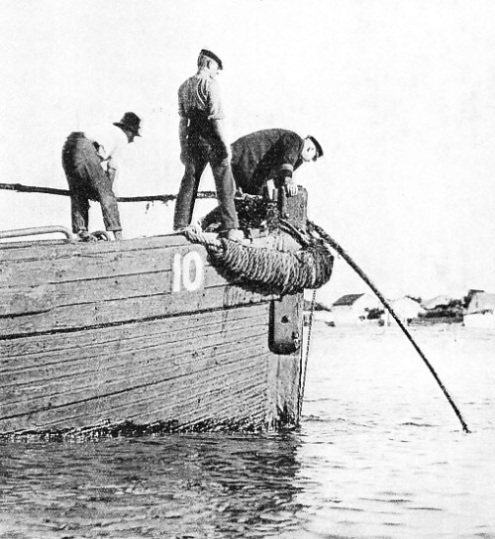 When at last the cable has been found the grapnel is hove up by the drum of the picking-up gear and men are lowered over the bows in boatswain’s chairs to put “stoppers” on the cable, that is, to secure it with chains and ropes. Leads are then taken from the conductor to the testing-room. The electricians now take charge, and their first job is to discover on which side of the cut the fault lies. It may be that the fault lies at some distance - this being discovered by resistance tests - whereupon the good end of the cable is buoyed and the faulty end is placed over the bow sheaves. The ship then steams ahead, picking up until she has taken up the portion of the cable containing the fault. Constant tests are made and if possible conversation is kept up with the cable house on shore. As soon as it is ascertained that the fault has come inboard, the cable is stoppered, cut, and a new portion is spliced on. BEFORE REPAIRING A FAULT in a submarine cable, the repair ship marks with a special buoy the position of the fault, which has been located by the electrical engineers ashore. 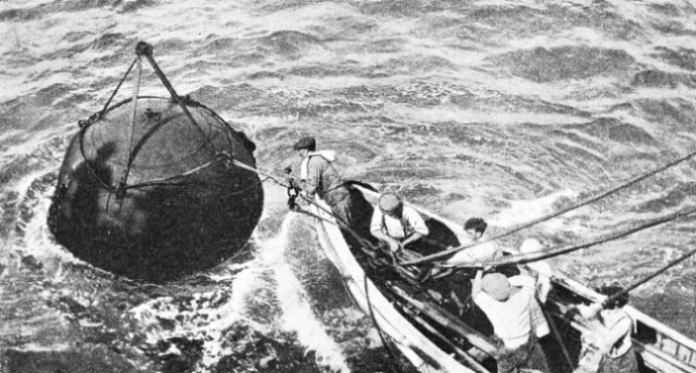 The buoy, with its flag to make it conspicuous, then acts as a centre for the ship’s grappling operations, carried out by means of special grapnels that pick up the cable from the ocean bed. Further tests having proved that all is in order with the new portion, the ship returns to the cable buoy, picks up the other end, a further splice is made, and the cable is now repaired and in working order again. In making a joint it has to be seen that no air bubbles have become imprisoned in the gutta-percha insulation. If there were such bubbles they would burst under the pressure of the sea and would probably soon cause a further fault. In certain spots, as, for instance, San Francisco Bay or Valentia Harbour, Ireland, there are many cables and grappling is a delicate operation because of the risk of disturbing the wrong cable. To avoid this risk divers are sent down to untangle the cables and repairs are carried out in barges. Within recent times there has been brought into use an ingenious device for preventing a repair ship picking up the wrong cable in shallow water and where many shore-ends are likely to be found. This device is the “Leader Gear”. By using it, a working cable can be distinguished from a “dead” one, and when several cables have been brought to the surface, by merely placing a small frame-coil on the cable the outgoing signals can be clearly heard. Thus risk of cutting the wrong cable is obviated. You can read about Cable Ships at Work and on the Cable Ship Faraday in Shipping Wonders of the World; and you can read about The First Atlantic Cable in Wonders of World Engineering.